Wave Runners, Jet Skis, Sea-Doos. Personal watercraft, or PWCs, come in many makes and models, all of which promise the operator a good time on the water. They are found on most waterways these days, and in 2016, there were more than 70,000 PWCs registered in California. PWCs are fast, powerful and fairly easy to operate, but they are also involved in many boating accidents and injuries. With their ever-increasing popularity, it is important for all PWC users to know how to operate their crafts safely and with courtesy at all times. California boating accident statistics paint a picture of PWC use and misuse. For example, PWCs account for only 10% of registered vessels, but were involved in 17% of all boating accidents reported in 2016. Of those accidents, the majority (62%) collided with another vessel or fixed object. 44% of PWC accidents involved people who had borrowed a vessel and 28% had rented their equipment. Three main causes of PWC accidents: inexperience, operating at excessive speeds, and operator inattention. These accidents could be avoided if the operators had taken the time to read the owner’s manual and safety literature provided by most dealers/rental companies after a sale, or had taken an approved safe boating course and obtained a California Boater Card. You’ll have fun on your PWC if you operate it like any other boat – with skill and respect. 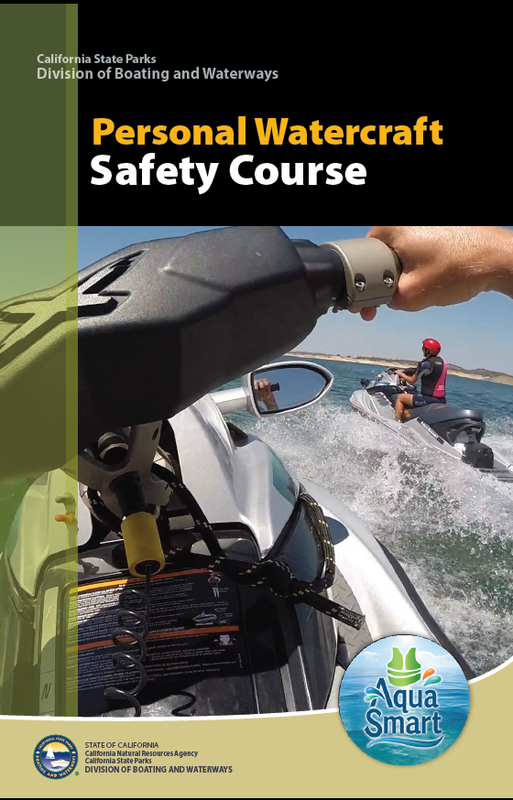 This course will tell you how to operate your PWC safely, prevent accidents, be aware of hazards, and use courtesy and good judgment so you can enjoy your PWC to the fullest. Be sure to watch the PWC Safety Video for quick tips on PWC safety. PWCs are boats that provide an incredible amount of fun and enjoyment for the user if used properly and safely. Good judgment, courtesy, knowledge of boating rules and regulations, and knowledge of your individual craft are all critical elements for safe use. Accidents may be avoidable if the operators take the time to read the PWC Course Book. This 20-question quiz will give you an indication of your PWC safety knowledge, based on what you already know and what you’ve learned from the video and online course book. More importantly, this quiz will help you brush up on safety points you may still be unclear about, but are the Rules of the Road to operate your PWC safely, prevent accidents, and be aware for hazards. The multiple choice quiz takes only minutes to complete. Good luck!